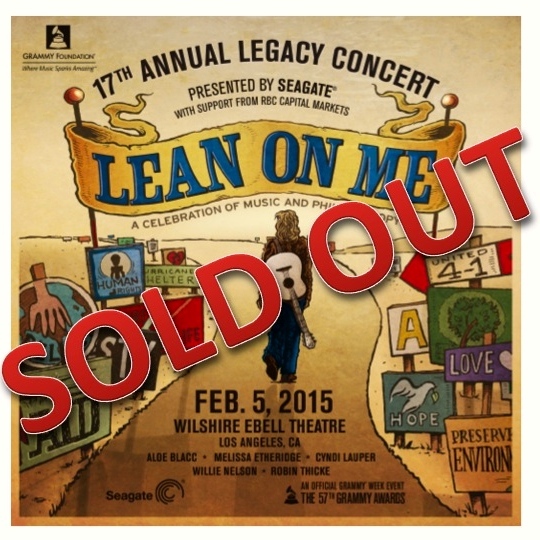 The GRAMMY Foundation hosts “Lean On Me,” the 17th Annual Legacy Concert featuring performances by GRAMMY winners Melissa Etheridge, Cyndi Lauper and Willie Nelson; GRAMMY-nominee Robin Thicke; and singer/songwriter Aloe Blacc. “Lean On Me”—presented by Seagate — explores the evolution of music’s role in advancing philanthropic causes and celebrate the visionaries behind the creation of those iconic songs and concerts. Tickets are $45. A complimentary reception follows. For more information and to buy tickets, visit http://wl.flavorus.com/GF/LeanOnMe, or call 323.908.0607 -press 1.